Dr. Sangtae Kim, the visionary leader of the Morgridge Institute for Research that is the private arm of the Wisconsin Institutes for Discovery, discusses he Morgridge Institute in the video below beginning at about 4 minutes into the program. His comments are related to my previous Pixetell video presentation on the Wisconsin Institutes for Discovery and to my presentation in Singapore last year on the parallels between the innovation experiment in Singapore and that of the Wisconsin Institutes for Discovery. Thank, Dr. Kim! In Conquering Innovation Fatigue, we begin with an examination of some of the reasons that people pursue innovation. Not all innovation is driven by a desire for wealth. In fact, a large number of innovators are more interested in seeing their work make a difference in the world than in becoming rich (many want both, but the desire to see real results from one’s work is often essential). Social entrepreneurship and humanitarian innovation provide evidence of this. In the book, we highlight Empower Playgrounds (EmpowerPlaygrounds.org), the non-profit innovation engine that is bringing educational success to thousands of African children by creating playground equipment that generates power for LED lamps that children can take home so they can study and do homework after the finish their chores at home. Something as simple as a portable electric lamp, charged by innovative playground power generators, makes the difference between educational failure and graduating with opportunities for college. Many thanks to Ben Markham, the CEO of Empower Playgrounds, for recognizing the need and driving so much collaborative innovation to bring hope to western Africa. Through his World Bicycle Relief charity the ponytailed entrepreneur hopes to put millions of sub-Saharan Africans aboard special heavy-duty bikes designed to withstand the continent’s rugged roads while carrying 200 pounds of cargo–enough for a weaver to bring his rugs, or a farmer to tote his produce, to market. Moreover, he aims to promote a self-sustaining bicycle economy with regional operations assembling the bikes and area mechanics trained to repair them. Frederick is making many changes in the bike as well as crafting a business model for distribution and maintenance that will meet the needs of many parts of Africa. It’s not about getting rich, but about truly making a difference in the world for thousands of people. That’s inspiring innovation! What are your favorite examples of altruistic innovation or social entrepreneurship helping Africa? Although countless books explain why innovation matters and how to benefit from it, few address the reasons that companies and individuals don’t innovate successfully. That’s where this volume comes in. Jeff Lindsay, Cheryl Perkins and Mukund Karanjikar provide many examples of corporate, political and structural barriers that block innovation, the forces that smother it, and the organizational and social factors that make it difficult. Their analytical book expertly blends research and firsthand perspectives. Though the authors are somewhat fond of jargon and coined terms, their guide is a welcome addition to the innovation canon. getAbstract recommends it to innovators, human resources professionals and executives who want to inoculate their companies against the disease of innovation fatigue. Conquering Innovation Fatigue is an important and much-needed contribution to the innovation literature. If you have any interest in innovation, this book is a must read. The book recognizes that the struggle corporations are facing to provide real innovation is complex and goes far beyond a lack of good ideas. On the contrary, there are behavioral, organizational, and external challenges that are the real culprits for squelching innovation. My firm consults with a lot of inventors and entrepreneurs, and I’ve been recommending this book to each of them before they head too far down the road. The value proposition to inventors/entrepreneurs will become evident within the first couple of chapters, but many larger corporations will benefit from the principles shared in this book as well. I’ve lost count with the number of companies that have a “Not Invented Here” culture that I’ve come in contact with. The NIH chapter alone is worth putting this book in your library…. Intellectual Property (IP) is the currency of the 21st century, and “innovation” is the key ingredient to any IP recipe. The authors of Innovation Fatigue clearly have a deep and profound understanding of this principle, and have pulled their insights together in a way that an individual inventor to a CEO of a Fortune 500 company can understand and put into action. Well done! Dr Lindsay and his coauthors have a hit here, probing how to identify and avoid major factors (fatigues) that destroy innovative effort. They create a 3×3 framework for this discussion, focusing on threats to property and trust, systemic flaws, and barriers to collaboration as applied across individual, organizational, and environmental factors. The framework felt slightly forced at times, but still I found it extremely useful; and the authors draw nicely from their experiences to provide numerous case studies and examples that document their conclusions. As a patent attorney who has worked many years with innovators in a large corporate setting, I have faced firsthand many of the fatigue factors they discuss. This work is a crucial tool for R&D managers but, more importantly, it is a “must read” for leaders of an organization who have asked themselves “how do I get my teams to be more innovative”. The answer – which is not based in cost cutting, efficiency or shareholder opinion – may not be popular, but it is informative. This book provides an in depth overview of the barriers to innovation. The authors have a deep understanding of the innovation process, and have written this book to categorize the various pitfalls that can prevent inventors from capitalizing on their ideas, or prevent new ideas from achieving success in the marketplace. There are a lot of books on the invention process, but relatively few on the challenges that can prevent good inventions from becoming innovations. This book takes a systematic approach to the subject. The chapters form a checklist that anyone can use to make sure that all barriers to innovation are minimized in their company, organization, or personal entrepreneurial endeavors. I especially enjoyed reading the case studies. The book contains so many interesting stories about famous and not-so-famous inventors. I was unfamiliar with many of the stories and learned a great deal from the examples–particularly those where the inventor failed in his/her effort to bring an idea to fruition. There are so many roadblocks on the inventor’s path. This book is like a road map for inventors or those who work with inventors–it details the pitfalls as a way to improve your chance of success. At the same time, the many stories make it fun to read. I highly recommend it. I also appreciated the thorough attention given (in the second half of the book) to legal issues, including patents and government regulation issues, that can hinder innovation progress. A great collection of real examples were provided, leaving me with the equivalent of several lifetimes of careers in corporate management, patent law, and research & development – along with the wisdom gained thereof. Thank you Lindsay, Perkins, and Karanjikar for your contribution via this book. This book explains the many fatigue factors by organizing them smartly into 9 easy to remember categories detailed in chapters 4 to 17. The book is well organized and easy to read. Interestingly, executive managers can take easy steps to remove fatigue factors and then have an easier time concentrating on the major barrier to innovation in the companies. Hence, I recommend this book as a nice read for innovation managers, and I strongly feel it would make a great reference book. This is truly a unique book about innovation. Unlike most of the innovation books out there, this looks straight at innovation and masterfully helps you to recognize and overcome the 9 innovation fatigue factors. The advice is very practical, with examples and stories that helps the inventor understand the fatigue factors from the perspective of an individual, the organization, and the outer world. The examples are extremely well-written so that you become engaged in the story, while clearly understand what’s causing the fatigue and what you can do to be a successful innovator. The stories explaining the fatigue factors have a tremendous range; something will speak to you given your own perspective on invention and innovation. . . . There are many more gems within this book. It’s well-written, full of engaging stories, and a treasure box of great insight about invention and innovation. It is rare that a business book hits the right balance between thoughtful reflection, actual experience, historical grounding and practical recommendations. Conquering Innovation Fatigue has nailed it exceptionally well. It is packed with stories of real people and inventors and real companies dealing with both success and frustration in bringing innovation to market. But examples are selected with care to illustrate some very important aspects of the creative process and remind us that innovations is really about humans, not just ideas. We look forward to your review as well! Missing the Green Light of Opportunity During the Economic Chill? Posted by: Jeff Lindsay | Comments Comments Off on Missing the Green Light of Opportunity During the Economic Chill? A Wisconsin stoplight in our last snow storm. 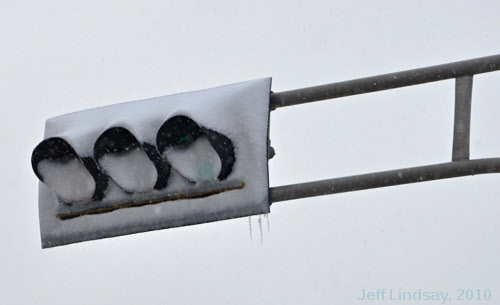 During our last snowstorm in my part of Wisconsin, I took the photo above of a traffic light whose traffic signals were largely hidden by snow. I saw it as a metaphor for what happens when times of economic chill blind entrepreneurs and businesses to the opportunities around them. A downpour of discouraging economic data and fear can pile up like snow on a traffic light and obscure the green light of opportunity that otherwise could be telling you to move ahead. The lesson is not to just plow ahead, nor is it to remain at a standstill until the chill ends, but to learn to look for the fainter clues that show the true color of the largely hidden glow. This may be the right time to move ahead for the opportunity before you. Indeed, many great companies have their roots in times of economic recession. While others are cutting back on innovation and preparing to put their companies permanently in park, those who invest in innovation now will have the decisive advantage and be miles ahead of the competition when the chill ends. Look closely – there may be a green glow under all that snow. Comments Comments Off on Missing the Green Light of Opportunity During the Economic Chill? I am intrigued by innovators who develop skills in multiple seemingly disconnected areas and then draw upon their multifaceted expertise to find new levels of innovation success. These “multivators™” may be a big part of the yeast the raises the dough of our future economy. They can be difficult to manage, however, and may seem like sufferers of ADHD to many observers. Understanding their potential, their employment needs, and their ability to drive innovation if properly motivated–or properly “multivated™”–may be essential for successful corporate and university innovation in the future, and is a topic am I currently exploring in depth. If you are such an individual or know someone’s story that we should consider in future writings, please let me know!